So this is the last post I have for the INTO THE DARK series, and I have an exciting announcement to make: There will be a third book in the Into The Dark series! Carolrhoda Lab, an imprint of Lerner Books, will be publishing Book 3 (most likely in Fall 2016). Bree Despain is celebrating the good news with a contest. A character named after you in Into The Dark Book 3, a Cupid’s Arrow Ring, and because Daphne and Haden love music so much: a $25 iTunes giftcard. A Cupid’s Arrow Ring and an Into The Dark swag pack. All you have to do to enter is solve the following anagram and then use the Rafflecopter at the bottom of this post. 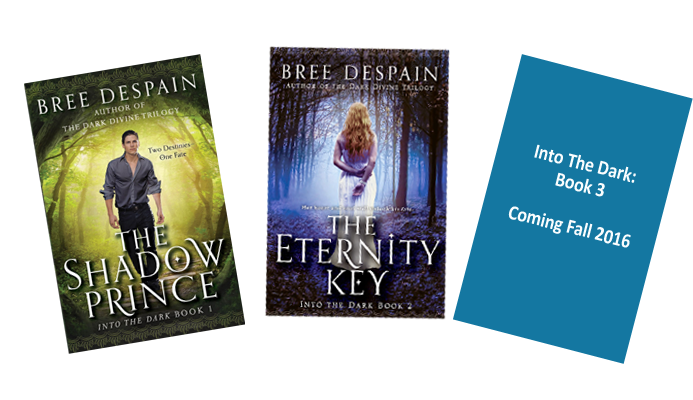 Three words, reading THE ETERNITY KEY will help you solve the puzzle, and Daphne’s gifts. U.S. Residents only. The contest is open for two weeks (so if you need a little help solving the puzzle, you have enough time to read THE ETERNITY KEY). The winners names will be posted on the Bree Despain’s blog on May 28th. Winners will have 30 days to claim their prize or else their prize will be forfeited.